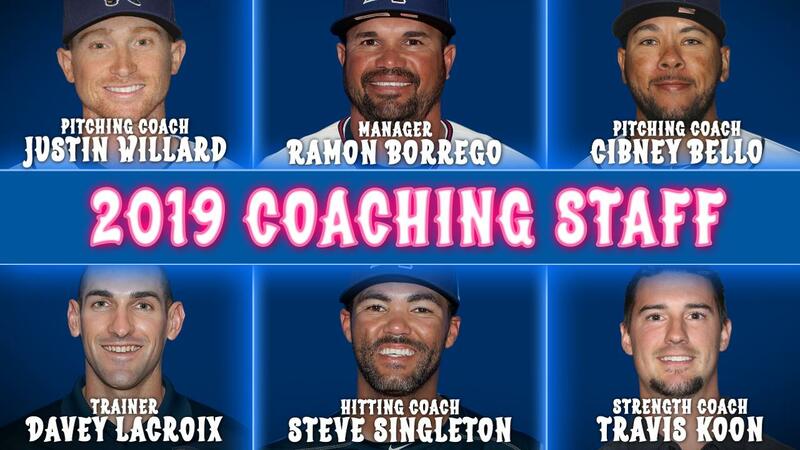 The Minnesota Twins announced their Double-A minor league coaching staff assignments for the 2019 season on Monday, promoting six coaches from within the Twins farm system to Pensacola for the Blue Wahoos' first season as a Twins affiliate. The Blue Wahoos will be led by Ramon Borrego, who moves up from High-A Fort Myers after leading the Miracle to the 2018 Florida State League title. He will be joined by a pair of additional promotions from Fort Myers, hitting coach Steve Singleton and trainer Davey LaCroix. Pitching coaches Cibney Bello and Justin Willard and strength coach Travis Koon will move up from Single-A Cedar Rapids to Pensacola. Ramon Borrego has coached in the Twins organization for 14 seasons, including 10 as a manager. After reaching Triple-A in a seven-season playing career with the Twins, Borrego became a coach in his native Venezuela for four seasons with the Twins affiliate in the Venezuelan Summer League. In 2009, he was promoted to manager of the Twins Dominican Summer League team before moving to manager of the Gulf Coast League (Rookie) Twins from 2010 through 2017. In 2018, he was promoted to High-A, leading the Fort Myers Miracle to the Florida State League title. In his managing career, he's coached future major leaguers and Minnesota Twins regulars Miguel Sano, Eddie Rosario, Max Kepler, Kyle Gibson, Jose Berrios, and Byron Buxton and has played an integral role in developing prospects in the Twins highly-ranked farm system, coaching over half of the players currently on the Twins top 30 prospects list. Steve Singleton joined the Twins organization as a coach in 2017, serving as the hitting coach for the Fort Myers Miracle for the past two seasons. During his tenure with the Miracle, Fort Myers finished as the fourth highest-scoring offense in the Florida State League and went to the playoffs both seasons. A three-time Minor League All-Star, he hit .281 and reached Triple-A in a six-season playing career spent mainly in the Twins system. The Blue Wahoos will employ a pair of pitching coaches in 2019, adding Cibney Bello and Justin Willard to their staff from Cedar Rapids. Under their dual-tutelage, Kernals pitchers finished with the third-best team ERA (3.40) and WHIP (1.26) in the Midwest League during the 2018 season. A native of Venezuela, Cibney Bello pitched five seasons in the Seattle Mariners system and three in independent baseball before retiring in 2010 and becoming a pitching coach intern for the Arizona League (Rookie) Mariners in 2011. He took over as their pitching coach for the 2012 and 2013 seasons and was promoted to Single-A Clinton for the 2014 and 2015 seasons. He joined the Twins in 2016, serving as the Gulf Coast League (Rookie) Twins pitching coach for two seasons before joining Cedar Rapids in 2018. Justin Willard joined the Twins system in 2018 with Cedar Rapids, his first season as a pitching coach in affiliated baseball. He pitched for Northern Oklahoma Junior College and Concord University during his playing career before working for Radford University as an assistant coach for five seasons prior to being hired by the Twins. The Blue Wahoos training staff will consist of strength coach Travis Koon, a promotion from Cedar Rapids, and athletic trainer Davey LaCroix, who moves up from Fort Myers. The Blue Wahoos will open the 2019 season on Thursday, April 4 on the road against the Mobile BayBears before playing their home opener at Blue Wahoos Stadium on Wednesday, April 10 against the Jacksonville Jumbo Shrimp.